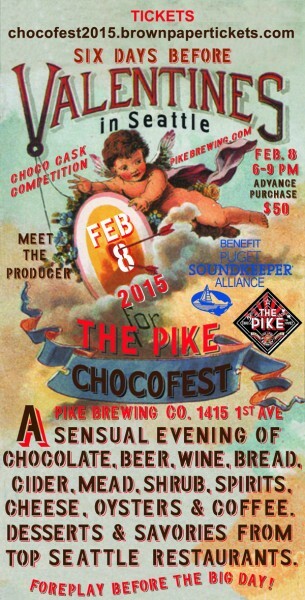 (Seattle, WA) – The 7th Annual Pike Brewing Chocofest will take place on Sunday, February 8th, in the Pike Brewery building at 1415 1st Avenue from 6:00 – 9:00pm, as a benefit for the Puget Soundkeeper Alliance. 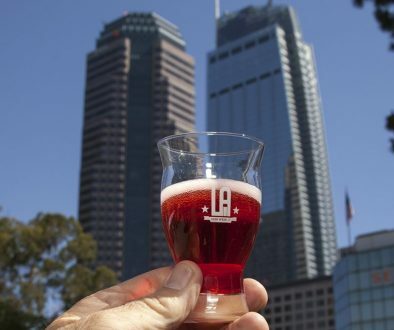 It’s been called “the best event of the year!” Now in its seventh year, what started as a gathering of beer and chocolate lovers in Pike’s Microbrewery Museum has become a nationally recognized and anticipated feast of the senses. This romantic event takes place on Sunday, February 8th from 6:00pm to 9:00pm, on all three levels of the Pike Brewery building. The tasting includes local and imported beer, chocolate, wine, cider, mead, and spirits, along with artisan cheese, bread, desserts, oysters on the half shell, and savory foods from many of Seattle’s top restaurants and hotels. Enjoy live music, taste the offerings, and talk to owners and representatives from close to 100 vendors. Admission includes: all food, authentic CHOCOFEST 2015 commemorative tasting glass, 10 drink tickets, music, and up to $4 off validated parking at Russell Investment Garage. Chocolatiers and Confectioners: Tease, Trevani Truffles, Evolve, Theo, Hot Chocolate, Chukar Cherries, Fran’s, Gelatiamo, Carter’s Chocolates, KuKuRuZa, Rocky Mountain Chocolate. Other Specialty Foods: Karam’s, The Shrubbery, Simple & Crisp. We hope you will join us for PIKE CHOCOFEST 2015!